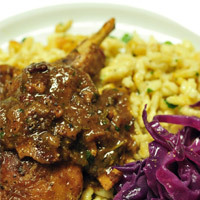 Whether you spell it spätzle or spaetzle, this German noodle or dumpling is a perfect accompaniment to classic dishes like Sauerbraten (sour or pickled meat that’s braised and served with a sweet and sour gravy), Rindsrouladen (rolled beef braised in a sauce), Wiener Schnitzel (breaded pork cutlet), Hasenpfeffer (braised rabbit in dunkelweizen, bacon and clove) or other Austrian | German dishes that are served with a sauce or gravy. Yet this isn’t the only way to eat spätzle—with a few extra ingredients it can be transformed into a hearty main course, too. A cooking device with holes is needed to make spätzle. Before investing in more expensive equipment, try pressing the dough through the holes of a perforated kitchen spoon with a solid spoon. Another option is to use a colander with small- to medium-sized holes. A colander that rests on the edge or lip of the pot is perfect for this task. Simply add the batter and press it through into a pot of boiling salted water. If the colander nests too deep into the pot, causing water to enter the lower holes, the colander must be held above the water level. Those who love spätzle should invest in a spätzle maker. I prefer a press-style maker with a removable pin to make cleaning easier. There are several different models available, but those from Germany are well built, made for the task and available online for $70–$90. 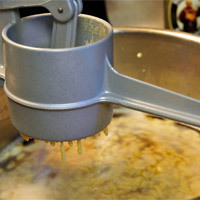 A potato ricer can also be used in place of a spätzle maker. (If your ricer has options for sizing, use a medium-size die.) The other type of spätzle maker looks like a cheese grater on a track with a feed tube that moves back and forth, grating or cutting the batter into the cooking water. I’ve never had much luck with this style of maker and prefer a different finished texture in my spätzle. 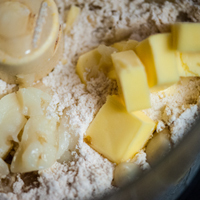 The next step is making the batter. After countless batches of these German dumplings, I have learned a few tricks that other recipes don’t share. Most spätzle recipes use only eggs, flour and salt and lack water, milk or beer, which, when mixed with flour, would create gluten. So use the gluten in the flour to your advantage. Since all-purpose is the easiest flour to find and use for these recipes, beating the eggs into the flour and salt is critical. An electric mixer is by far the easiest way to make the dough. 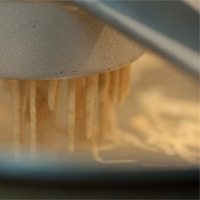 Using a whisk attachment and letting the motor do the hard work of mixing for several minutes is key to creating a spätzle with just enough bite and chew, without sacrificing fluffiness, tenderness or the integrity of the noodles as they cook. Simple ingredients plus the right technique make spätzle perfect as a side dish or an entrée. 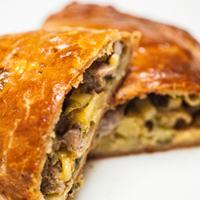 This substitute for potatoes or rice can also be found in Austrian cuisine and goes well with Chicken Paprikash and many other saucy main courses. Fit an electric mixing bowl with a whisk attachment and add the cracked eggs. Beat the eggs for a minute on medium speed until they’re light, fluffy and pale yellow. Add the flour and salt, then incorporate the flour on a low speed or it will fly out of the mixing bowl. Increase the speed to medium and beat the batter for 3 – 4 minutes. The batter should be a little stringy, with a slight pull to the dough. The water in the eggs will combine with the flour and create gluten as they are beaten. 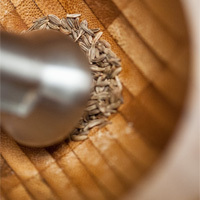 Turn off the mixer, remove the whisk, cover and rest the dough for 20 – 30 minutes to fully hydrate the flour. As the batter rests, fill a large pot with water and enough salt to taste and place over high heat. Bring the water to a boil, then lower the heat to a simmer. Take the spaetzle maker , colander or slotted spoon, place it over the simmering water and fill it halfway with spätzle batter. Lightly press the handle down to slowly expel the thin noodles into the water. Fill the press again, about two to three times per batch. Stir the spätzle with a skimmer to gently break the noodles up and to avoid any clumps. Cook for 5 – 6 minutes. 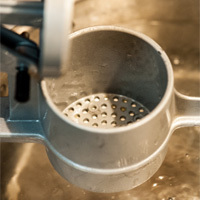 Using a spider, skimmer or another hand strainer, remove the spätzle from the water into another large bowl. Repeat this process until all the batter is cooked, and then drain any remaining water from the bowl. 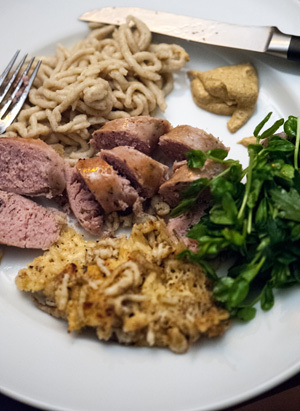 Once the spätzle is boiled they can be plated and eaten as is, or served under a sliced Sauerbraten, Wiener Schnitzel or Hasenpfeffer. 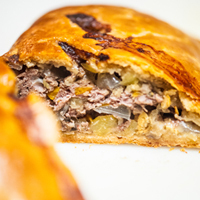 Fluffy, tender and delicious, they are great either way. Here are a few other serving suggestions. To create more texture, fry the batter instead. Place a sauté pan or skillet over medium-high heat and add 3–4 tablespoons of fat (vegetable oil, olive oil, rendered bacon fat or, for extra richness and Old World flavor, goose or duck fat). Or add a nutty note with browned butter. Add the drained spätzle in an even layer. 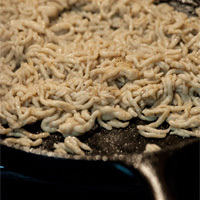 Let the noodles sit for 2–3 minutes, allowing the spätzle to brown and create a crust. Do not stir. Then stir them gently, and give them a few more minutes to brown again. Do this 3–5 times, depending on the heat of your stovetop. Lightly season the fried spätzle with salt and freshly cracked peppercorns before transferring them to a serving bowl. To add more flavor and color and to help build flavors that are also found in hops, try mixing in chopped parsley, marjoram, thyme or chives. I find these flavors enhance the Noble hops used in many German lagers and can aid in beer pairing. To further enhance the flavor of the bacon fat, try adding cooked crumbled bacon or speck, a German-style cured meat that is cold smoked for a long period of time. Along with the herb seasonings, the speck will bring out a wonderful richness when paired with Rauchbier. 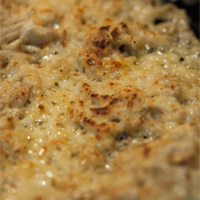 Another way to use the spätzle is in a gratin. Take 1/2 – 3/4 pound of grated cheese (quark, Gouda, smoked Gouda, or a beer-washed cheese, like Weisslacker), mix it with the slightly cooled spätzle, and place it into a lightly buttered oven-proof container. 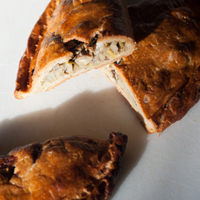 Garnish the top with a handful of cheese and place the baking dish in an oven preheated to 375˚F | 191°C. Bake the gratin for 20 – 35 minutes, until the cheese has melted and the top has turned a lovely golden brown color. Another variation for baked spätzle is to add a German Beer Cheese Sauce, essentially creating a German-style Mac & Cheese. Follow the German Beer Cheese Sauce recipe and mix in the boiled and drained spätzle, tossing to combine. 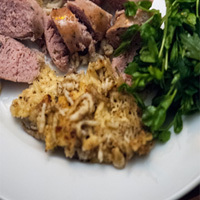 Pour into a buttered baking dish (topping with seasoned bread crumbs or another cup of the grated cheese used in the German Beer Cheese Sauce) and place into an oven preheated to 375˚F | 191°C for 30 – 45 minutes, or until the sauce is bubbling and the cheese on top is golden brown.